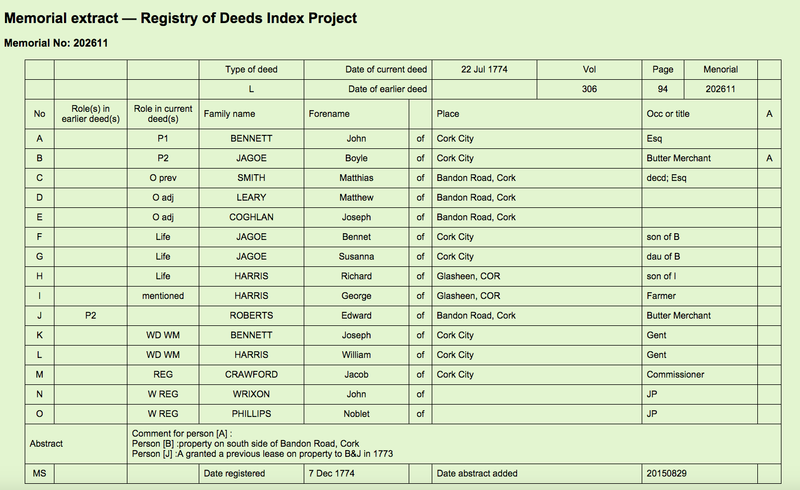 West Cork Colony 1774 in Bandon Road, Cork City. It is interesting loking at this abstract. The church records which have survive for St. Finbar’s Cathedral and St. Peters Church of Ireland are replete with names originating i West Cork. Time and again you come across Jagoes, Attridges etc. It also seemed to be common for couples to come to Cork to marry and presumable spend a few days of a honeymoon there. Re butter making, John Jagoe of Bantry whose father was from Dunmanway reputedly ran a shop for a while in Bandon Road/Barrack St.
Another name that keeps cropping up is the O’Leary family of Glasheen. Though Protestant they are most likely to be the same line as the Art O’Leary rebel of Raleigh, Macroom also lawyers. Up to recently the area to the west of the city was the first pot of call for people from the west.